Influenced by his father, Mike Maki, he developed a love of camping, motocross, skiing, and other outdoor sports from a young age. At the age of 14, he moved to Oahu, Hawaii, with his family, where his older brother Claude got him into surfing. 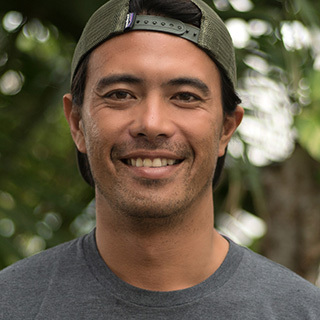 On returning to Japan after graduating from Kalaheo High School, he got his Japanese professional surfer qualification. Never interested in competitive surfing, he left the contest scene after getting his qualification and headed down the road of the trip/soul surfer. Between trips for surfing photo shoots, he also did media-related work, basing himself in Chiba for a decade. Drawn by the great waves of the outer reefs and an environment ideal for skin-diving and spear-fishing, in 2011 he moved down to Okinawa, where his daily lifestyle showcases activities that can be enjoyed in any field, matching the season and natural conditions. On days without waves, he grabs his mask, fins, and spear-gun, skin-diving to catch fish sustainably, which also helps him train. For the last two years he’s served as the Surfing Goodwill Ambassador for the Papua New Guinea Tourism Promotion Authority, spreading surfing around the country and helping children out.